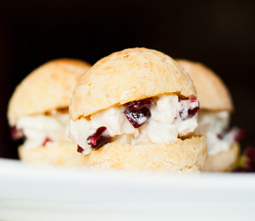 P*DE*Q Chicken Salad Sliders - A recipe from Savor California, the online showcase for extraordinary gourmet foods and beverages from California. Soak cranberries in a bowl of warm water to cover 15 minutes, then drain well in a sieve and chop. Whisk together mayonnaise and lime juice in a medium bowl. Add cranberries, chicken and celery. Toss to coat with dressing. Put a spoonful of the chicken salad in each P*DE*Q.